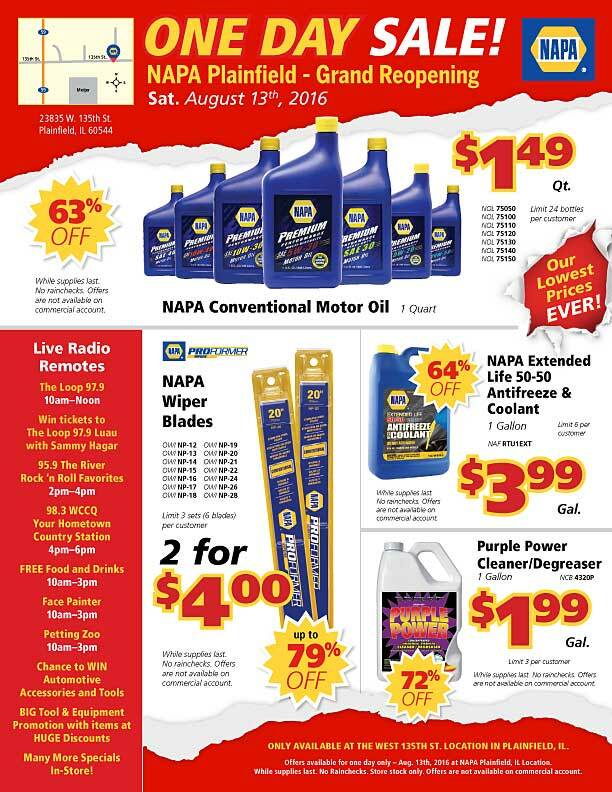 NAPA AUTO PARTS, the nation’s top brand in the automotive aftermarket, will unveil its newly revamped facility in Plainfield with a blowout grand reopening celebration on Sat., August 13 from 7:30 a.m. to 7:30 p.m. 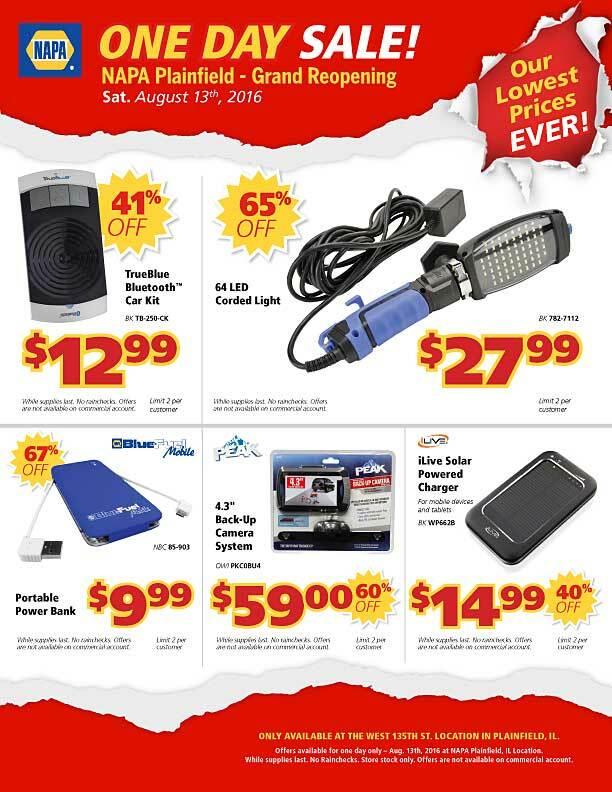 The one-day only event will feature family-fun activities and hundreds of NAPA’s most popular items at rock-bottom prices – plus in-store coupons – for summer travel. Plainfield Mayor Michael Collins and Will County Executive Larry Walsh will officiate at a ribbon cutting ceremony at 11:00 a.m. Located at 23835 W. 135th St., this store has served Plainfield for more than 30 years. 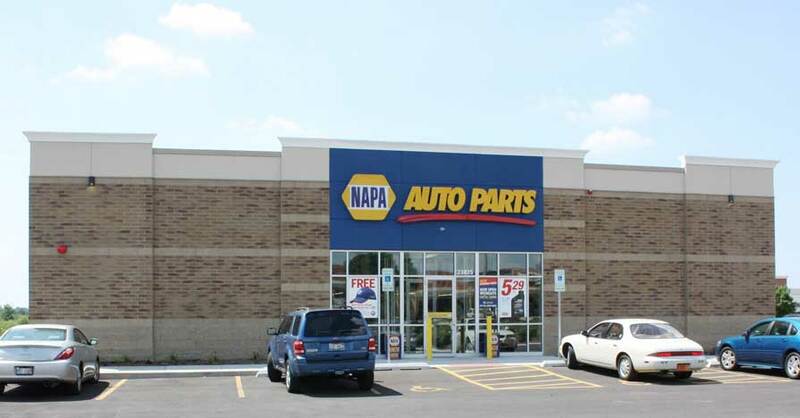 To accommodate increasing demand for auto parts and supplies among residents in the surrounding communities, the Plainfield NAPA store was selected as one of the company’s national priority locations for extensive upgrades. The transformed store offers a clean new look, an expanded product lineup and a significantly enhanced experience for consumers. For information and sale items, visit http://plainfield.napagrandopening.com/. Free food and drink: 10:00 a.m. – 3:00 p.m.
Kids’ face painting and petting zoo: 10:00 a.m. – 3:00 p.m.
WLUP – The Loop 97.9, Live Remote Broadcast: 10:00 a.m. – 12:00 p.m.
WERV – 95.9 The River, Live Remote Broadcast: 2:00 p.m. – 4:00 p.m.
WCCQ – 98.3 Your Hometown Country Station, Live Remote Broadcast: 4:00 p.m. – 6:00 p.m. The grand reopening will also support the Intrepid Fallen Heroes Fund – with a $1 donation by NAPA for every NAPA “We Believe in Heroes Bucket” sold.